Deputy Commander Capt Jordan Hayes welcomed everyone and invited Lt Col Juan Tinnirello to lead the Pledge of Allegiance to the flag. Commander Maj Rivas was in San Francisco, caring for his father in the hospital. We had three visitors: Scott Booth from the Maryland Wing, Mr. Terry Baldwin and Mr. Clinton Carter a friend of Lt Bob Adams. 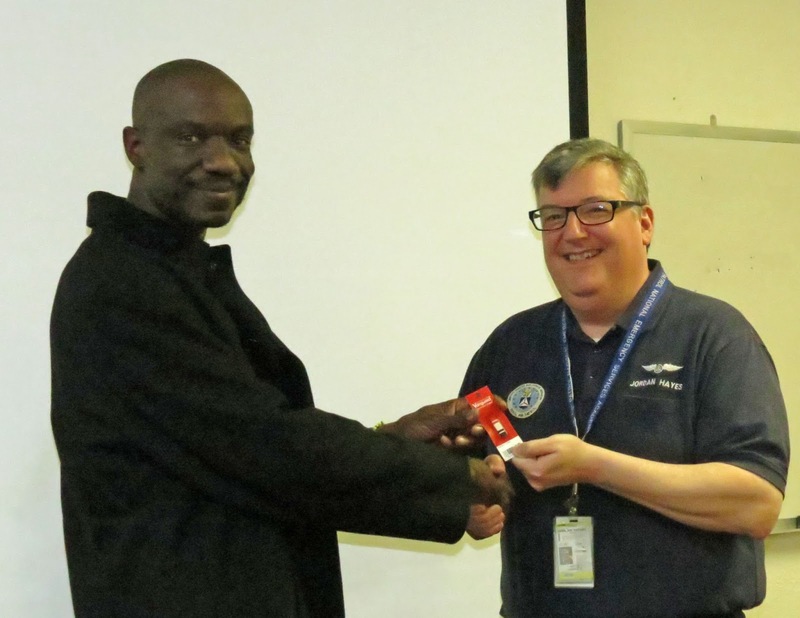 We also had a guest, Mr. Jon Prater, FAA Safety Team, who conducted a program about Aeronautical Decision Making (ADM) and Single (Pilot) Resource Management (SRM). This program covered our regular Safety Education portion of the meeting and it was moved to the beginning of the meeting, to facilitate Mr. Prater's departure, after a long day of regular work. 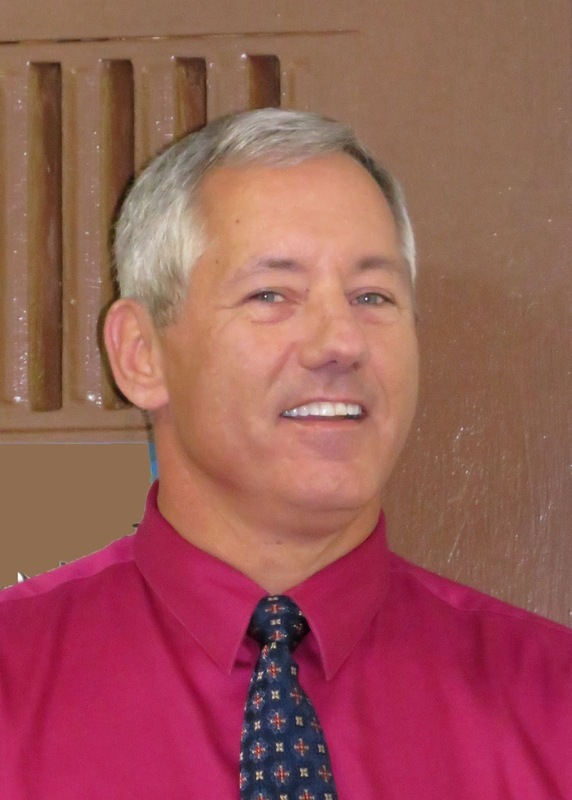 Mr. Prater covered many of the typical errors committed by pilots, especially the urge to reach destination when the weather is not right or the push from other people to complete the trip. His presentation included several pictures as well as many examples from his experience with the FAA. It was an excellent and very informative presentation - if you were not there, you missed a good opportunity to improve your skills as a pilot. 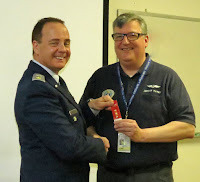 Capt Hayes presented a Squadron 188 patch to Mr. Prater, as a token of appreciation for his valuable presentation. Capt Hayes commented on the Squadron's Events for January. 9 Jan: G1000 ground school conducted by Capt Michelogiannakis. 16-17 Jan: Mission Scanner School by Maj DeFord. 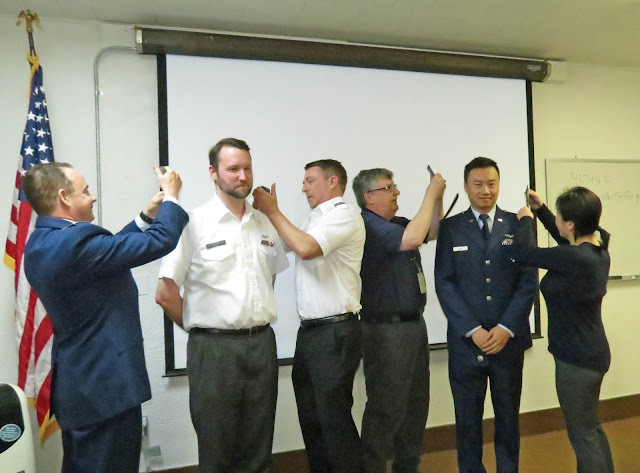 30 Jan: Group 2 Banquet, awards from Wing Conference, plus Maj DeFord received a CAP Achievement Award and 1st Lt Choate received a Commander’s Commendation. Maj Luneau, Imperial Valley (IPL). 26 Jan: 16-T-4226 Western Air Defense Sector (WADS) Felix Keynote, Maj Luneau. 28 Jan-2 Feb: 16-T-4261 Super Bowl VIP/Outreach Maj Fridell and Luneau, Capt Brown, Cao, Hayes and Rivas, Lt Choate, Hipp, Hollerbach and Kraus. Capt Cao and Capt Gast receiving their new epaulets. Transport Mission Pilot (TMP) Maj Fridell. CD Renewal, Maj DeFord and Capt Hayes. Capt Wilson, Glider Check Pilot Examiner. SM Wayne, General Emergency Services (GES). Aircraft usage: 32.1 hrs. Glider Usage: 3 Form 5 (F5) last weekend and tow pilot training, Lt Gast, Capt Wilson. Vehicle usage: 154 miles. 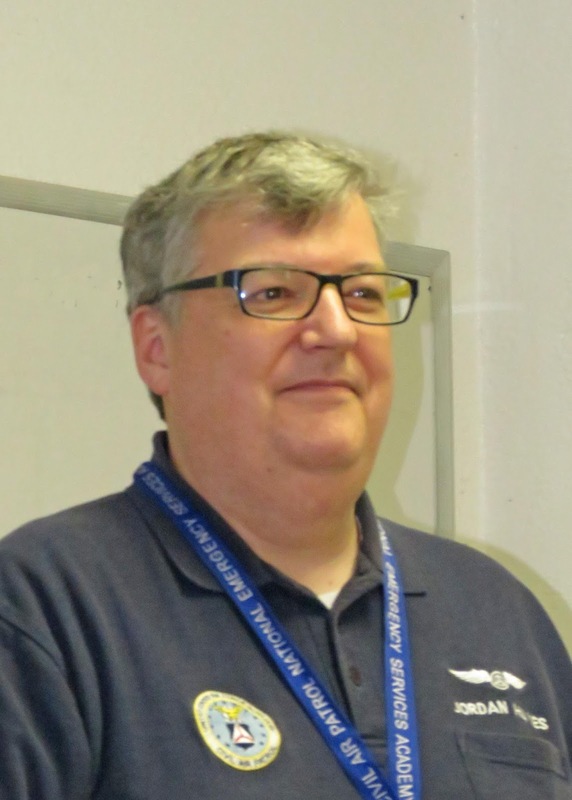 Aerospace Education: Lt Bitz will conduct a class 16 Feb at the squadron. Wing PA: Squadron 188 has 9 members and 10 positions at Wing. Maj DeFord (ES training/Ops Qualifications Approval Coordinator) Maj. Fridell (Aerospace Education; Deputy Director /North); Maj Ironfield (Stan/Eval: Mountain Training Officer); Maj Luneau (ES Training/Asst Ops/Exercise Approvals Coordinator); Maj Riebli (Assistant Deputy Director of Legal Affairs/Group 2); Capt Eichelberger (ES Training/Airborne Photography Training Coordinator); Cap Fenolio (Staff Legal Officer); Capt Hayes (Deputy Director of Communications; Logistics Comm Officer); 1st Lt Bitz (Internal Aerospace Education officer). A big THANK YOU to Maj Luneau, Lts Rugroden and Stevulak for repairing the men’s restroom. 3 Feb: Western Air Defense Sector (WADS) Falcon Virgo mission plus media event. 4-8 Feb: Runway 15/33 closure due to Super Bowl 50 activity. 13 Feb: Airborne Public Address System (APAS) Workshop at Gnoss Field. 19-21 Feb: Group 2 IPL. 27-28 Feb: Mission Scanner, Search & Rescue (SAREX) at OAK, Maj DeFord. 26-27 Mar: Check Pilot School, Capt Michelogiannakis. Maj Luneau: Home Land Security Ribbon (HLS), (10 sorties); 1st Silver clasp/CD (68 sorties); Air Search & Rescue (AS&R) 3rd Bronze/1st Silver (90 sorties). Senior Member (SM) James Weeks: Level 1 Membership Award. 1st Lt Cao (duty performance), to Capt. 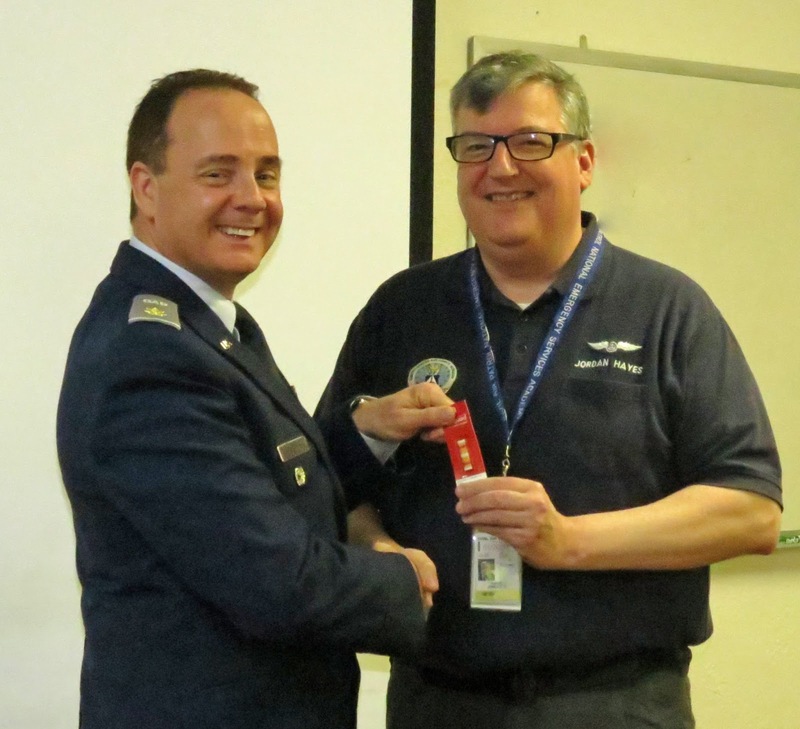 1st Lt Gast (Mission Related Skill: Glider (CFI) to Capt. Twenty seven people attended the meeting that ended at 21:05 hrs.